In June 2001, WSU Regents approved the recommendation that WSU finance students be allowed to “invest” $1,500,000 of the University’s Contributed Funds Quasi Endowment Fund. Specifically, students participating in the Cougar Investment Fund make recommendations to the University’s Senior Investment Manager. The fund objective is to outperform S&P 500 while maintaining comparable risk. The mandate requires the fund to invest in a sector-diversified portfolio. We attempt to outperform the market by identifying undervalued securities within each sector. 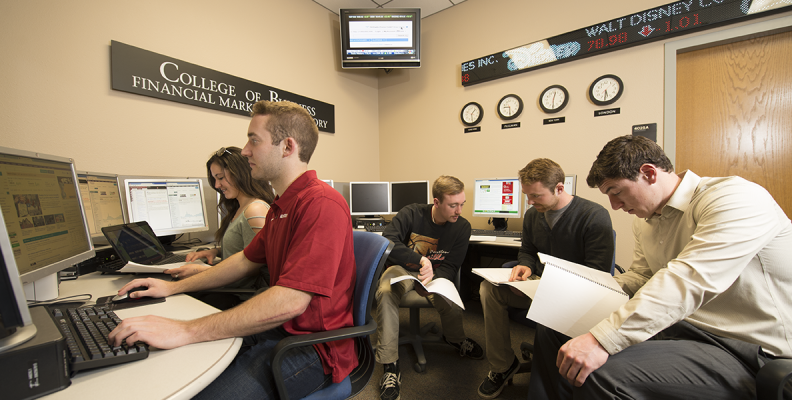 Portfolio managers and stock analysts investigate securities with finance faculty in a trading room with an electronic ticker board and real-time financial markets news broadcasts. The portfolio is managed as the central focus of a year-long course (Cougar Investment Fund I and II – Fin 437/438). Up to three students are assigned as Portfolio Managers. The other students are assigned as sector analysts (Consumer Discretionary, Consumer Staples, Energy, Financials, Health Care, Industrials, Materials, Technology, Utilities) with one from each sector assigned as the lead sector analyst. The buy/sell recommendations from the Analysts require a written report and presentation to the class. All recommendations are put to a class vote. Following a favorable vote, a written buy/sell recommendation signed by the industry analyst, portfolio manager, and professor is then forwarded to the University’s Senior Investment Manager for execution.